He's hoping he can come up with an idea. Hope. Change. Jobs. Yes we can! Oh, the glory days of 2008. Everything was going to get better. 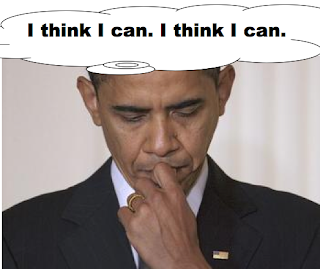 However, Barack Obama doesn't understand what he's gotten himself into. And he mistakenly thinks that he can fix it. Here is why the Obama recession will continue. First, the president needs to stop blaming someone else. He evoked George Bush's name yesterday and blamed him for our current financial ills. Baracky, you're the captain of the ship. Learn how to steer or we'll find someone else in 2012. It took George W. eight years, two wars and some reckless spending to dump $4.36 Trillion on to our national debt. In less than three years, Barack added $3.9 Trillion to our national debt. And most of that money was "stimulus" that was supposed to create millions of jobs. I hope he kept receipts because he might want to return his plan and get some of that money back. In the first post of this series, I covered the stock market, housing and the psychology of what is really going on down on Main Street. Here's a simple wake-up call. Barack Obama has no clue how and why jobs are created. He thinks he can spend us into a better economy. All these government infrastructure jobs that were supposed to be created with the stimulus money don't really do anything. They put people to work temporarily, not creating sustainable industries; and for every dollar the government spends it gets 25¢ back in taxes. If I give you a dollar and you give me a quarter back, I'll go broke real fast. Now, you're an expert at Washington math. What creates jobs? You only need to know one word - DEMAND. When people or industries want something and want more of it, they need to increase their operations and hire more people to meet the DEMAND. Right now, American industries are locked and loaded to produce SUPPLY to meet DEMAND. But until DEMAND picks up, we sit and wait. How do you create DEMAND? War is one way. Military contractors flourish. Medical supply companies do well. Prosthetic providers whip out limbs faster than a willow tree by a pond. Casket makers box up the scraps of war. If you study the economy over the last 120 years, you'll see that innovations in manufacturing, machinery, medicine, automobiles, appliances, building materials and technology have all been drivers in expanding economies. A confluence of ideas, inventions and capital came together to produce products that became in DEMAND. Private industry works with or without a president. At the turn of the last century, Henry Ford revolutionized manufacturing with the assembly line. Cars that were made by hand by craftsman who produced a few at a time were able to be made by the thousands. Ford needed workers to run his factories - jobs. Steam locomotion allowed larger loads to be carried across the country, which fueled the growth of the west. New farming equipment provided food products that could be shipped to markets far from where they were grown. Grocery stores popped up everywhere. There were more inventions and ideas that fueled the growth of the early 20th century, but you get the concept. During the Great Depression, Roosevelt tried all the programs that Obama thinks are original ideas. They didn't work then and they won't work now. War put our men overseas and our women ran the machinery of war. After the war, the Baby Boom started. Housing, cars, appliances and more were DEMANDED by young families. Detroit was in its Golden Age during the 1950's. When Kennedy became president, the economy was languishing. The Viet Nam War was great for defense contractors, but did little else for the country, except increase DEMAND for burial plots. Nixon, Carter, they tried. Reagan came along. He started spending a lot of money building up our military - jobs. But completely out of his control, there was a thing called the computer that companies like IBM, SUN Microsystems and DEC were building and selling to businesses. Typewriters were replaced by terminals. Computers needed storage, networking and lots of circuits. Businesses had high DEMAND for the new productivity of the computer. Fax machines and photocopiers became part of every office. IBM made a self-contained desktop computer that they thought only businesses would buy. However, consumers became interested in them and the PC became a product in DEMAND. And everything related to a computer became in DEMAND - hard drives, floppy discs, monitors, laptops, printers, networking systems, modems, etc. Electronics and technology were the engines of growth through the Reagan years and the Clinton years. Good ole Bill took credit for all those jobs "he created," when we all know it was Al Gore inventing the Internet that really made it all happen. Then, Clinton expanded the Community Reinvestment Act, which Carter had initially put into law. Democrats who took over Fannie Mae and Freddie Mac started bending the rules. Banks got involved by the government twisting their arm to do business in a new way, a riskier way. When the money started rolling in, no one cared. Now, anyone could afford a house; DEMAND skyrocketed. Then, five big Wall Street firms went to Treasury Secretary Paulson and struck a secret deal. Instead of being limited to 10 times leverage on their loans, they negotiated a 20 times leverage on loans. Wall Street also created derivatives that made the paper trail even more convoluted. Three of those five firms went out of business and nearly sunk the entire economy. Greed was all that was in DEMAND. Five times during the Bush presidency W. went to the Finance Committee Chairman, Barney Frank and warned him that the housing market looked like it was overheating. Frank said, "What, you want to deny the poor the American dream?" So, people that should never have purchased a home were snatching them up. Boomtowns, like Las Vegas saw incredible growth. People were lined up to buy homes for days. Fights broke out over what place in line a person was supposed to be. It was insane. Then it crashed. What is in DEMAND now? Everyone bought their imported flat panel TV's, everyone has a cell phone; computers are a throw away commodity; fax machines, and printers are cheaper than toasters or steam irons. Two years ago in Las Vegas, I remember driving around and seeing lots of girders, no workers. Office complexes with stickers still on the windows, no landscaping and no workers. You can drive through any major city and see countless car dealerships that are simply large lots with weeds sprouting through the cracks in the asphalt. FOR RENT, FOR LEASE signs attract no buyers. Large factories lay idle. Entire industries have crashed. Anyone in the market for an RV or a Harley? How about a boat? A timeshare? A vacation condo? How about a house? No takers? Where will the next boom come from? When I was trading stocks and options a few years ago, biotech seemed to be the next horizon. But those industries take a long time to come up with something and whatever it is, it is very expensive. I hate to be the bearer of bad news, but all those manufacturing jobs that went away - they ain't coming back. They are gone. If you were in manufacturing, you're going to have to learn something new. I have always been a big believer that the third world countries will make everything with their cheap labor, and America will need to become the inventors. We need to become the creators of revolutionary intellectual property that can be sold to the world. Here in Cleveland, we are the #1 city for IT job hiring in the country. Ohio has also been a leader in medical related job hiring over the last six months or so, too. Technology. Medicine. Alternative energy is not far enough along in the R&D stage to be useful, and the cost is still out of reach unless you're from Hollywood. Rosanne Barr has a complete green house. Good for her. I can't afford the new light bulbs the government mandated we buy. But information is where we can excel. That is why I'm on the Internet. With smartphones, iPads and other tablet devices, everyone has access or will have access to the Internet, no matter where they are. And they'll be looking for content, information, ideas, things that will make their lives better or easier. Content is and will be in DEMAND. Content. Content and connectivity. Our lives are so busy that we don't have time to sit and have a beer anymore. We're all on the go. Our friends are thumbnail photos on a screen. We know their name and their picture. If they change their picture, they may as well have died. These industries of biotechnology, IT, alternative energy, content generation, intellectual property, connectivity DEMAND smart individuals; creative individuals; innovative individuals. The sad part is that a large chunk of those jobs will go to better educated foreigners. Where does the future start? In your home, today. If you have kids, you need to pay more attention to them; spend more time with them; be more involved with their schoolwork; stress the value of an education. Parents need to teach their children well - paraphrasing a song from the 1960's. If your sons and daughters are into hip-hop culture, tell them they need to pull their pants up and stop dressing like hoes. Buy a white shirt. Press some pants. Prepare to work. And stay in school. A new day will dawn. A new technology will come along. A new industry will form. And you want your children to be ready for it. If you're out of work or you are worried about your job, you have to start looking into new things. Go into business for yourself. Entrepreneurship is hard work, but it can pay off big. Presidents can do very little to produce jobs. They can create conditions that make markets with DEMAND grow faster. But until there is DEMAND for products and services, either from consumers or from industry, hope is a four letter word. Presidents can do more to hurt an economy than they can to help it. Barack's lack of leadership, wild spending, murky direction and his conspicuous absence when it's time for tough decisions aren't helping matters. Napoleon Hill in his classic Think And Grow Rich said that everything begins with an idea. An idea. That's it. Come up with an idea. And then act on it. If you're looking to Washington for ideas, that's hopeless. You have to look into your soul and come up with your own idea or ideas. Can you make your company better? Can you improve work flow? Can you offer something to people that have a need. If they have a need and you can fulfill that need, now you have DEMAND. Americans DEMAND a better America. But what Americans need to do is DEMAND more of themselves. DEMAND more of their children. DEMAND more of the people in their community to keep it safe. DEMAND that kids pick up the trash they throw on the ground. Little things add up. DEMAND more. One of my all-time favorite quotes comes from basketball legend, Michael Jordan. He said, "I demand more of myself than other people can dream of." Wow. That is a high bar. That is what greatness is all about. Demand more of yourself. Somewhere along the way we stopped demanding more of ourselves. We settled. Be like Mike. DEMAND more of YOU. While you're working on yourself, the president is not DEMANDING more out of Congress and that is why the Obama recession will continue.